When you import contacts, you have a few options for mapping phone numbers. Here are a couple of pictures to describe where the imported phone numbers show up in Address Two. If you have only one phone number for a contact, you may want the phone number to show up in the company information(1 Phone-Main) and the contact information (3 Phone-Direct). 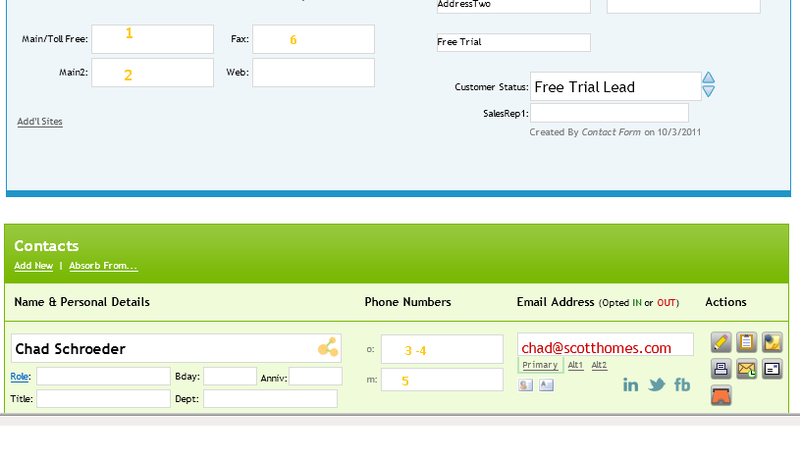 You can map the phone number to more than one Address Two field. The side bar in Address Two can be helpful. But when you shrink you window, it can get in the way. When this happens, just refresh your browser. The bar detects the window size and goes away when there is not enough room. Google Docs has long been our preferred method for storing files related to AddressTwo accounts. But, you might find that on occasion, the file-size limitations of the Google API prevent you from storing large files (over 10mb) on an Account in AddressTwo. Fortunately, there is a simple workaround. First of all, since the file-size limit is only imposed on 3rd party applications like AddressTwo, this means that you can indeed still upload the file directly to Google Docs. To do this, go to docs.google.com and log in. You can place the file wherever you choose, but AddressTwo defaults to placing uploaded files in the "AddressTwo_Projects" folder. Once uploaded, wherever you upload it, you can then link this file back to the desired AddressTwo account using the "link existing file" link. Address Two does not speak directly to outlook, but it is possible to add tasks to Address Two and get them to your outlook calendar through Google calendar. The first step is to make Address Two your main point of entry. You can get tasks from Address Two to Outlook, but you can not get tasks from outlook to Address Two. You will need to associate your Address Two Account with a Google Account in Address Two under Admin menu, Google Tools. It is recommended to manage tasks in Address Two to keep things simple. We are the simple CRM. Synchronizing adds to the management overhead, but if need to get tasks to Outlook, this is the process. There are 2 new ways to manage time and tasks. Tasks now display time, if there is time assigned to a task. 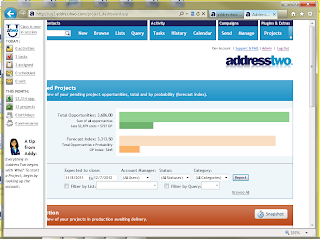 If you have the Project Manager, you can add the allotted hours for a task on project tasks. 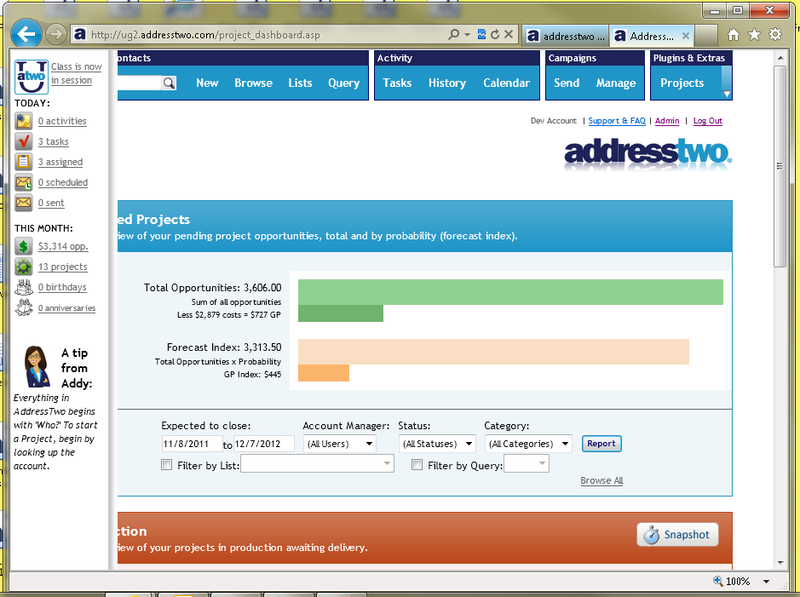 The Hours show up on the CSV export of tasks under projects. 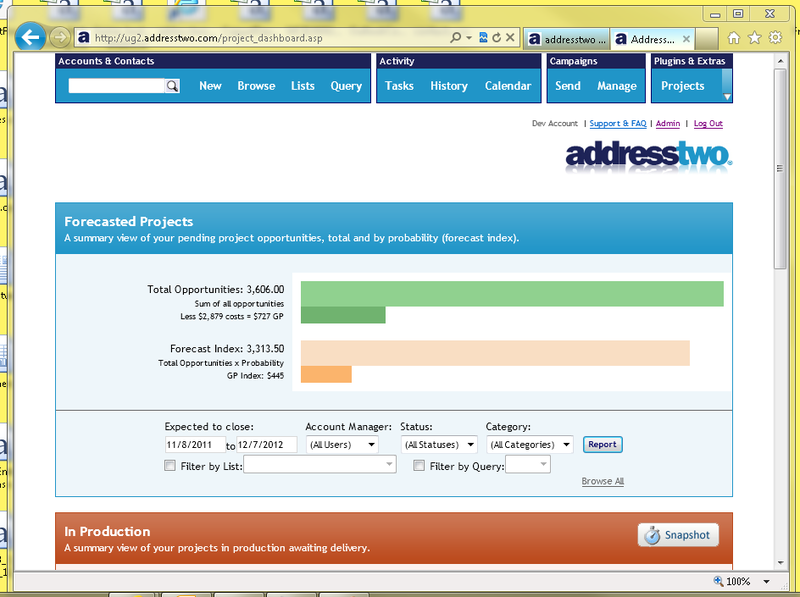 We are excited to introduce a new way for you to view your contacts in AddressTwo: a visualization. And, our first integrated visualization method is the popular Duct Tape Marketing Hourglass™ method. Visualizations create simple ways to group your contacts according to rules, such as their Customer Status, and view those groups visually rather than in a query result. The effect can be very powerful. In one glance, you can visualize where your leads hit a bottle-neck in the process of becoming a customer. 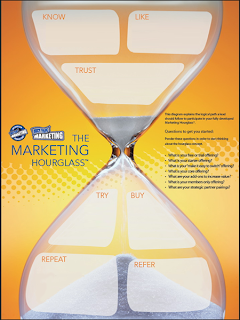 The Marketing Hourglass charts the progress of contacts from people who merely "Know" about you all the way beyond just the sale to those loyal fans who "Refer" you to others. 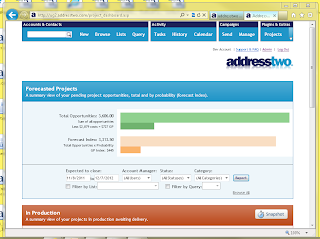 To find Visualizations in AddressTwo, hover over the "Browse" button in the top menu. If you are interested in learning more about how to put The Marketing Hourglass into practice in your business, download this free whitepaper from Duct Tape Marketing. A tiny icon has been added to the Project View screen with big possibilities. Next to the primary contact, you will find an email icon, like below. This icon does what you would expect: it opens a new email message to the contact listed. But, you will quickly notice that the subject line contains some important data. 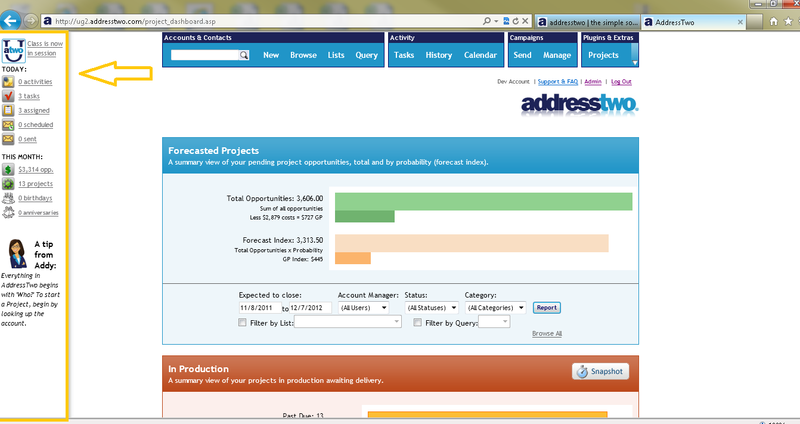 Namely, the project number. When Addy receives emails with this in the Subject line, she knows not only to pair the history record with the contact, but also the specific project as well. Outlook 2010 behaves a little differently than previous versions. Here is a link to instructions for exporting contacts into a CSV file. 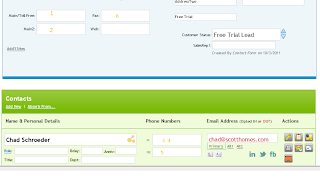 One of the main principles of our simple CRM is to show features only when they are relevant. If you assign a task to a different user, the notify check box becomes available. 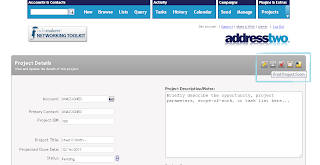 This feature design is it to notify the user via email if another user assigns them a task. Presumably, the other user may or may not be logged in to address two, but has access to email, and needs to be notified of a task before the next day when they will be emailed a task list from address two. Can I just upload my own HTML instead of using your template designer? Absolutely! Many of our customers employ a graphic designer, or have contracted with a Partner Provider who provides graphic design services. For a true designer, our simple email editor may feel restrictive. Or, perhaps you have previously designed templates that would be cumbersome to re-create in AddressTwo. To upload your own HTML, create a new email template using the wizard, but select the "Plain Letter" layout (the last option) which will advance you directly to the HTML editor. 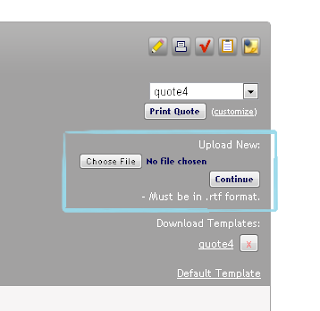 There, click the "Source" button to view the HTML source of the template. You may paste your HTML source over the existing source to effectively create a new template entirely of your own composed HTML. I just wanted to give you a shout and show you a couple new videos we're going to push out via Address Two. The ability to put YouTube videos right into our emails from A2 makes it a great application for connecting and re-connecting with folks. Thanks for having such a great platform. If you can imagine your company using AddressTwo like this, you should connect with Dave on LinkedIn or Twitter to talk about how he could help. To assist you in remaining compliant with CAN-SPAM regulations, AddressTwo automatically inserts a simple unsubscribe link in the bottom of every outbound email sent through our Campaign Manager. This offers your audience the easy way of saying "don't email me again." But, what if you want a customer to say "only email me for this type of information, but not this. If they unsubscribe from your email about rubber duckies, but they want your emails about Acme-brand anvils, they've inadvertently removed themselves from all your future email communication. There are two solutions to this problem, one a matter of practice, and the other a matter of functionality. Note: DO NOT modify this link, including it's querystring variables, in any way. Your email might look something like this: "Click Here to manage the emails that you receive from our company." Of course, hyperlink the text click here using the link provided above. The result is a link to a page where each recipient can modify their own list memberships. Be advised, however, that this means your list memberships will be revealed to the contact. So, if you have a list called "people I don't like" you could be in trouble quickly. The second solution I would like to suggest is a matter of practice. While the above described functionality is helpful, don't neglect your responsibility as a marketer to practice responsible email marketing. Target your message to the audience you're reaching and you'll have fewer unsubscribes. This means email "blasting" to your entire database should be rarely used, if ever. Through good judgement and targeted content, coupled with offering your subscribers more control over the content they receive from you, you can dramatically reduce your unsubscribe rates. Adding custom fields to a database is perhaps the most fundamental way that you can tailor an "off-the-shelf" CRM product like AddressTwo to meet your company's own needs. However, that comes with a challenge: adding fields requires some knowledge of database structure, workflow, and engineering -- just the sort of thing that you would expect a SIMPLE CRM to avoid. We have just the solution... simple custom fields. So, you use Internet Explorer, but you do not use Microsoft's Outlook? Whenever you click the email link in AddressTwo, it attempts to open Microsoft's products (either Outlook, Outlook Express, or the latest Live Mail) to send the email. But what if you use GMail instead? So, you got started with AddressTwo and immediately decided: "Great, I'll put all my contacts in one place." You imported from Outlook, you imported your customer spreadsheet from Excel, and you had all of your assistants or staff members do the same. Now everyone's contacts are in one place.... just one problem: you all knew the same people. It removes them. It's called the "remove duplicates" tool. You will have to decide which to delete. Why? It's simple: computers will always do a poor job of guessing which set of data you wanted to keep. HINT: if you want to keep both, the names of the duplicates are hyperlinked to their respective accounts. Go there and ABSORB together. Determine which one to delete. If you have just started, and all contacts are new, it doesn't matter. If you have been using it for quite a while, there could be an important decision to make. If you have been recording a lot of notes, keep the one with the most history. NOTE: It's always easier to manually update contact data with more current than it is to manually re-enter previous historical notes. Know that it is indeed de-duping against the entire database. The contact to be deleted could indeed be one that another user has created. That's the reason this is an administrative permission function. Only admins can reach it.